For the treaty ending the Continuation War in 1944, see Moscow Armistice. For the 1920 treaty with Lithuania, see Soviet–Lithuanian Peace Treaty. For the 1997 treaty with Chechnya, see Russia–Chechen Peace Treaty. The Moscow Peace Treaty was signed by Finland and the Soviet Union on 12 March 1940, and the ratifications were exchanged on 21 March. It marked the end of the 105-day Winter War. 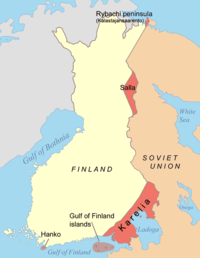 Finland had to cede border areas to the Soviet Union. The treaty was signed by Vyacheslav Molotov, Andrey Zhdanov and Aleksandr Vasilevsky for Soviet Union, and Risto Ryti, Juho Kusti Paasikivi, Rudolf Walden and Väinö Voionmaa for Finland. The Finnish government received the first tentative peace conditions from the Soviet Union (through Stockholm) on 31 January 1940. By this point, the regime had greater claims before the start of the war. The demands were that Finland cede the Karelian Isthmus, including the city of Viipuri, and Finland's shore of Lake Ladoga. The Hanko Peninsula was to be leased to the Soviet Union for 30 years. In February 1940, Finland's Commander-in-chief marshal Mannerheim expressed his pessimism about the military situation, prompting the government to start peace negotiations on 29 February, the same day the Red Army commenced an attack against Viipuri (now Vyborg). On 6 March, a Finnish delegation led by Prime Minister Risto Ryti travelled to Moscow. During the negotiations, the Red Army broke through the Finnish defence lines around Tali and were close to surrounding Viipuri. The Peace Agreement was signed on the evening of 12 March, Moscow Time, i.e. 1 hour on March 13, Finnish time. The protocol appended to the treaty stipulated that the fighting should be ended at noon, Leningrad time (11:00 Finnish time), and the fighting continued until that time. Finnish concessions and territorial losses exceeded those demanded by the Soviets pre-war. Finland was forced to cede nearly all of Finnish Karelia (with Finland's industrial center, including Vyborg/Viipuri, Finland's second largest city, Käkisalmi, Sortavala, and Suojärvi and the whole of Viipuri bay with its islands; in total, nearly 10% of the territory), even though large parts were still held by Finland's army. Military troops and remaining civilians were hastily evacuated to inside the new border. 422,000 Karelians, 12% of Finland's population, lost their homes. There was also an area that the Russians captured during the war, which remained in Finnish hands according to the Peace Treaty: Petsamo. However, the peace treaty also stipulated that Finland would grant free passage for Soviet civilians through Petsamo to Norway. Finland also had to cede a part of the Salla area, the Finnish part of the Kalastajansaarento (Rybachi) peninsula in the Barents Sea, and in the Gulf of Finland the islands of Suursaari, Tytärsaari, Lavansaari (now Moshchny Island о. Мощный), Peninsaari (now Maly Island, о. Малый) and Seiskari. Finally, the Hanko Peninsula was leased to the Soviet Union as a naval base for 30 years at an annual rent of 8 million marks. Contrary to common belief, the Soviet troop transfer rights by railway to the Hanko base were not granted in the peace treaty, but they were demanded first on 9 July, after Sweden had acknowledged railway transit of Wehrmacht troops to occupied Norway. Additional demands were that any equipment and installation on the ceded territories were to be handed over. Thus Finland had to hand over 75 locomotives, 2,000 railroad cars, a number of cars, trucks and ships. The Enso industrial area, which was clearly on the Finnish side of the border, as it was drawn in the peace treaty, was also soon added to the Finnish losses of territory and equipment. The new border was not arbitrary from the Soviet viewpoint. Before the war, Finland had been a leading producer of high quality pulp, which was an important raw material for explosives. Including the Enso factories, the Soviet Union captured 80% of Finland's production capacity. Finland had to cede 1/3 of her built hydroelectric power, mainly in the form of hydroelectric power plants on the Vuoksi River, which was badly needed in Leningrad, where the industry suffered a 20% shortage of electricity. The location of the new border was consistent with the Soviet defence doctrine, which envisioned taking the fight onto enemy soil through counterattacks and pre-emptive strikes. Under this doctrine, the ideal border should not allow the enemy to have natural defensible barriers; so instead of running through natural border locations like the Bay of Viipuri or the swamp region at the isthmus between Lake Saimaa and Lake Ladoga, the new border ran on the western side of those. But those positions were also very easy to encircle for an offensive enemy of the Red Army, which was soon to be shown. Large parts of the most populated southern region of remaining Finland had been connected to the world via the Saimaa Canal system, that now was severed at Vyborg where it connects to the Gulf of Finland. The southern part of the lost area was Finland's industrial heart. Karelia is considered the heart and origin of the Finnish culture. Before the Winter War, the Soviet sovereignty over the main part of Karelia, and Stalinist atrocities there, had been a major source of grief for many Finns. Under the terms of the treaty, the rest of Karelia was also lost. This started the Karelian question. Sympathy from world opinion seemed to have been of little worth. A certain bitter disappointment became a common feature of the Finns' view of other nations, not the least of Swedes, who had offered plenty of sympathy but did not fulfill their obligations of military support for Finland. The harsh terms imposed on the Finns led them to seek support from the Third Reich. The Winter War and subsequent Moscow Peace Treaty were core factors in leading to what would become the Continuation War. In the end, this might have been a necessary condition for Finland's survival in the World War. Only a year later, in June 1941, hostilities resumed in the Continuation War. ^ First published in English as Finland – Union of Soviet Socialist Republics. Treaty of Peace. Signed at Moscow, 12 March 1940; ratifications exchanged, 21 March 1940. The American Journal of International Law 34 (3), Supplement: Official Documents. (July 1940), pp.127–131. ^ Jussila, Osmo; Hentilä, Seppo; Nevakivi, Jukka (1999). From Grand Duchy to Modern State: A Political History of Finland since 1809. London: Hurst & Company. p. 187. ISBN 1-85065-421-2. ^ "Protocol appended to the treaty of peace concluded between Finland and The Union of Soviet Socialist Republics on 12 March 1940".